Vertical Farming Market size was estimated over USD 2 billion in 2017 and the industry will grow by a CAGR of more than 25% up to 2024. Rising population coupled with scarcity of arable land and demand for higher agricultural yields are the prime bolstering factors for vertical farming market growth in coming years. Vertical farming is an innovative method which is used to produce high quality fruits and vegetables across the year. This farming technique will transform the entire agribusiness in near future. It has several benefits over traditional farming such as low utilization of water, less dependency on soil fertility, agrochemicals and weather conditions. According to Food and Agricultural Organization (FAO) the urban areas are likely to account for 70% of the world population by 2050. This will put pressure to increase the agricultural productivity along with rise in competition for land to grow different crops. Increasing soil erosion resulted in scarcity of farming land and this will subsequently boost the overall market in future. For instance, in 1961 China had 0.16 hectares per person of arable land and it had reduced to 0.08 hectares per person by 2014. The above-mentioned trends are expected to follow and will contribute towards the growth of vertical farming market by 2024. Higher capital expenditure, lack of technical expertise & awareness, limitation on variety of crops grown coupled with high energy consumption are the key restraining factors that will hinder the market growth in near future. On the basis of product, vertical farming market comprises equipment, fruits, vegetable & herbs and aquatic species. Strawberries, tomatoes, lettuce and leafy greens are of the most commonly grown vegetables & fruits across the different region. Lettuce shows the growth rate of about 33% among the fruits, vegetable & herbs segment. Various aquatic species are also cultivated and the waste water from fish tank is used in cultivation of other crops as well. The segment will show the significant growth rate around 24% over the forecast time spell. On the basis of technology, global vertical farming market is segmented into aeroponics, hydroponics and aquaponics. Hydroponics segment holds the largest share in market and shows close to 27% CAGR in coming years. This is the most popular segment due to lower installation cost and ease of operation. Aeroponics segment is gaining popularity owing to the superior quality products obtained by implementing this technology and lesser amount of water & soil utilization rates. It is considered to be the most sustainable vertical farming technique and will show the substantial growth by 2024. Vertical farming is primarily done either in outdoor or indoor environment. Indoor vertical farm is the bigger application segment with a little less than 70% of the entire market share in 2017. Indoor farms include growing vegetables, fruits, fishes, etc. in controlled environment, warehouses, shipping or freight containers and parking spaces. Indoor vertical farming technique helps to consume less water and give high yield with minimum utilization of land as compared to traditional farming methods. Crops grown through indoor vertical farming method are protected from adverse climatic conditions. Outdoor vertical farming is considered as a technology-based farming approach which finds application in certain areas such as building walls, restaurant walls and can also be grown in skyscrapers on the stacked shelves and floors. Regions with low yields generally prefer outdoor vertical farming methods to control deforestation. 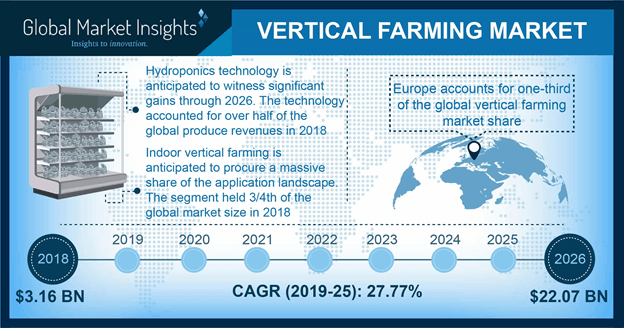 Europe vertical farming market shows a decent growth rate close to 24% owing to the presence of large number of venture capitalist and R&D centers in the region. Asia Pacific region shows the robust growth rate of about 30% and will become largest market for vertical farming in coming years. Japan and Singapore are the major markets for vertical farming and it is expected to rise in future due to rising land scarcity. Asian countries such as China, South Korea, India and Taiwan are the potential markets for this farming methodology. Changing food patterns, declining food self-sufficiency and initiatives taken by the government to promote vertical farming will drive the market in Asia Pacific. Some of the prominent players in vertical farming market are Sky Greens, Green Spirit Farms, Aerofarms, Plantagon International AB, Mirai Co. Ltd., American Hydroponics, General Hydroponics, Spread Co. Ltd., Urban Crop Solutions, etc. Many of these companies are at their nascent stage and are adopting various strategies to attract investments. Such steps are taken to expand their production capacity and increase the product reach to the potential customers. Different approach and business models are adopted by these companies to sustain and make vertical farming a profitable business. Companies are also inking partnership contracts with lightening system manufactures such as Everlight Electronics Co. Ltd., Koninklijke Philips N.V., Illumitex, Inc., etc. For instance, Nectar Farms an Australia based agri-business company partners with Lumigrow; which will provide both LED software and hardware in order to support growth of vegetables and vine crops. Many vertical farming companies sell their products either through direct selling to retail stores, restaurants, supermarkets or by vertically integrating with food companies. Vertical farming is the new method of producing food in vertically stacked layers in buildings, shipping containers, parking and warehouses etc. Rising population, rapidly changing climatic conditions and scarcity of water along with arable land are the factor driving the growth of market. High initial investment and inability to grow row crops such as rice, wheats, etc. may hinder the growth of vertical farming industry over the forecast timespan. 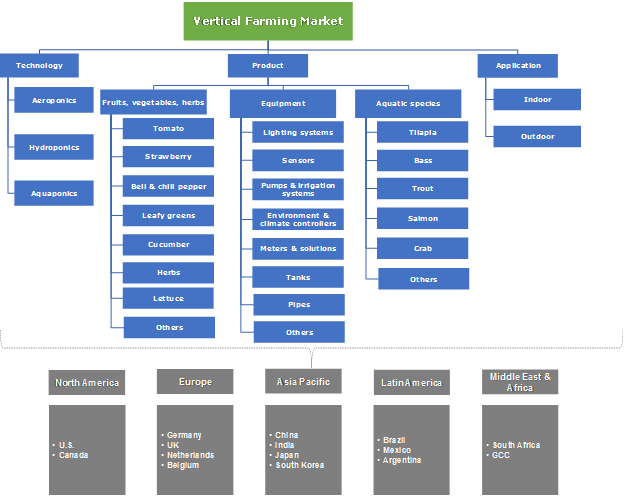 Will vertical farming industry prove to be a lucrative avenue for agro-based investors?